The projects listed here are not in any particular order or priority, but are presented here to generate interest and possible funding to allow their completion. 1. The passenger walkway from the parking area to the riding area is done. This makes the whole passenger area very much like a park. Some of the area is covered and there is even a multi-tiered fountain!. This project is done. Good job! 2. A two section restroom with hot and cold running water. This was a requirement from the county health department. This project is done. Good job! 3. Replace some of the gravel area with lawn. This project is done. Good job! 4. Installed new Passenger Shelter at the loading area. 5. Constructed new Gift Shop. This project is done. Another good job! 9. Redesign of Klamath and Western main yards and passenger terminal. The current layout of the yard does not match the current uses of the Klamath and Western railroad. The new design would allow longer trains to use the facility and help handle more train traffic during Train Mountain meets. This project requires approval of Train Mountain. Approximate costs $10,000. A portion of these funds may be available from Train Mountain as they will benefit from the redesign as well. 11. Install 2 switches to make a wye at the south end of the yard area. This will allow the turning of trains. Some minor dirt work will be required. Plastic ties switches with aluminum rail will be OK for this project. 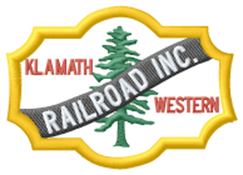 The Klamath and Western Railroad is a 501(c)3 non-profit corporation. Contributions to the organization may be tax deductible depending on the project or fund. Your support is welcomed and appreciated. If you, your company or your foundation is interested in supporting our efforts, please contact us at EMAIL.